Every app we build retrieves its data from the single source of truth — the server. React solves UI issues such as event delegation, code reuse, architecture and data binding. It leaves data syncing as the last major unsolved issue; syncing data in an easy and optimized manner is what new frameworks like Falcor and Relay attempt to solve. Tracking the status of AJAX requests is the only way we can accurately show loading statuses in our UI. The simplest (and most typical) case is tracking whether an individual request is one of PENDING, SUCCESS or ERROR. When tracking a series of events, however, things are more difficult. If we debounce a user&apos;s search to show live results we need to ensure that only the latest request is tracked. A user would expect to see search results for the current input value - not for a prior search term. + It eliminates request duplication as there&apos;s a single component making requests. - Passing data down from parent to child becomes tedious and verbose. 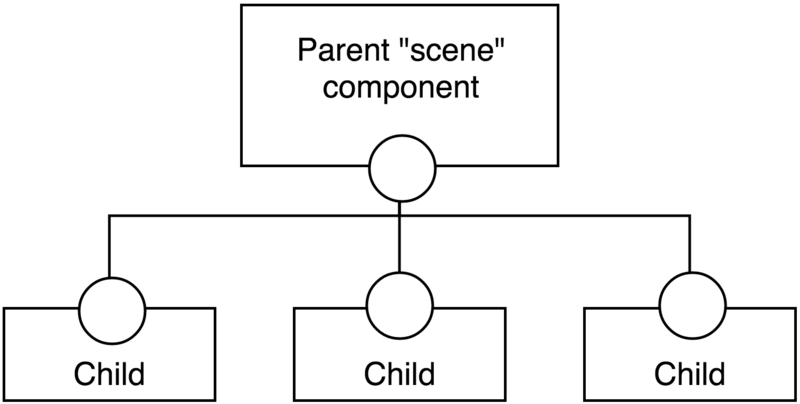 In this example, components request data separately while still being able to pass data to their children. The trend towards declarative data loading favours this model, mainly as this is easier to work with. Newer React frameworks such as Falcor, GraphQL and Resolver also batch and dedupe requests automatically. It&apos;s also possible to implement using plain Redux actions combined with autoaction. In Redux our reducers store a local copy of the server&apos;s state; that is, they cache data from the source of truth. As soon as we store the data in Redux it&apos;s possible that it is out of date. Caching is a hard problem. It&apos;s often easier (but less performant) to assume that all existing data is stale and re-request data than to implement a caching layer that works well. The data loading methods used should work the same when rendered universally on both the client and server.